IRVINE, Calif. – Razer™, the leading global lifestyle brand for gamers, today announced its all-new Razer Blade 15.6-inch gaming laptop* featuring Intel’s latest processor. The new Razer Blade is the world’s smallest gaming laptop in its class, boasting more display area and performance features. 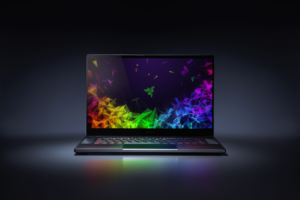 The available 144 Hz refresh rate 15.6” Full HD (1920 x 1080) display of the new Razer Blade enhances gaming and entertainment viewing with full-frame fluid motion graphics and 100% sRGB color. Users can also step up to 4K (3840 x 2160) resolution with touch functionality and 100% Adobe™ RGB color support. Each laptop display is individually custom calibrated in production for amazing color accuracy out-of-the-box. Best-in-class 4.9mm thin bezels flank the display, while retaining the ideal web camera placement at the top of the screen. The world’s smallest 15.6-inch gaming laptop measures as little as 0.66-inches thin and with a minimal footprint for ultimate mobility. The refined chassis is individually CNC milled from a single aluminum block to provide a sturdy yet compact design, and features a scratch resistant anodized black finish. Managing heat without sacrificing performance in such a small form factor is no easy task, but Razer innovated by utilizing vapor chamber technology for the cooling solution instead of the traditional heat pipes found in most gaming laptops. Beyond cooling the CPU and GPU, the vacuum-sealed vaporized liquid helps dissipate the heat generated from other components within the laptop. Ultra-thin nanoparticle material and graphite-based server grade thermal interfaces reduce hot spots and facilitate heat transfer, while high-performance low-noise fans push air across dual heat exchanges with 0.1mm thin fins, quickly moving heat out of the chassis and away from the user. The near bezel-less Razer Blade features the new 8th Gen Intel® Core™ i7-8750H and is available with NVIDIA® GeForce® GTX 10 Series graphics. The new Intel 6 core CPU eclipses its predecessor in throughput and responsiveness with Turbo Boost speeds up to 4.1 GHz. To drive fast frame rates users can choose either a GeForce GTX 1060 or GeForce GTX 1070 graphics card, featuring Max-Q design for an optimized gaming experience. For extreme multitasking, Razer also includes 16 GB of 2667MHz dual-channel system memory and fast PCIe SSD storage with configurations up to 512GB, with support for up to 32 GB of memory and up to 2 TB of storage. A large and clickable precision touchpad now provides more accuracy and improved gesture support. The new Razer Blade 15-inch laptop has been purpose-built for mega-tasking, able to handle intense gaming sessions and entertainment viewing, heavy design workloads, media production and general productivity. For a limited time, new Razer Blade owners can jump right in with access to $420 worth of games and software, including immersive VR titles such as Arizona Sunshine, popular games like Cuphead, and FL Studio Producer Edition, a professional music production suite from Image Line. The anti-ghosting keyboard is powered by Razer Chroma and offers 16.8 million colors per key, customizable through Razer Synapse 3 software. New power management options are also available, including modes to boost graphics performance or maximize the run time of the built-in 80Wh battery. Sound is delivered through dual front-firing speakers and features Dolby Atmos for immersive audio. Connectivity options includes the ability to output to up to three external displays via Mini DisplayPort, HDMI, and Thunderbolt™ 3. Connect peripheral devices to the laptop with three USB 3.1 Gen 1 ports. For additional viewing comfort and desk organization, Razer has made available a new Chroma Laptop Stand featuring a light strip up front and 3-port USB hub in back. When taking the new Razer Blade on-the-go, Razer also has released a new 15.6” Protective Sleeve made of durable, water resistant material with a slim profile design. The Razer Blade family of laptops have represented the pinnacle of power, portability and industrial design since 2011, and this new Blade is no exception. Razer also announced today the availability of its latest external graphics enclosure, the Razer Core X, with an MSRP of $299. The plug-and-play eGPU can deliver the latest desktop-quality graphics to Thunderbolt 3 capable PC and Macintosh laptops with external graphics (eGFX) support. As new graphics cards enter the market, they can be swapped in with ease. The new six-core Razer Blade 15.6” Gaming Laptop starts at $1,899 and is available starting today from Razer.com and select retailers in the United States, Canada, France, United Kingdom, Germany, and China. Razer’s award-winning hardware includes high-performance gaming peripherals Blade gaming laptops and the acclaimed Razer Phone. Razer’s software platform, with over 40 million users, includes Razer Synapse (an Internet of Things platform), Razer Chroma (a proprietary RGB lighting technology system), and Razer Cortex (a game optimizer and launcher). Razer services include Razer zGold, one of the world’s largest virtual credit services for gamers, which allows gamers to purchase virtual goods and items from over 2,500 different games.